Resonance String Quartet is an ensemble that was founded in 2013. Since then it has played at numerous different types of functions including corporate events, wedding ceremonies, receptions and parties. The formation of Resonance String Quartet was brought about by the musician’s mutual love and experience for chamber music as well as their studies abroad. The members of the Quartet are all in their own rights accomplished musicians and are highly qualified on their respective instruments. 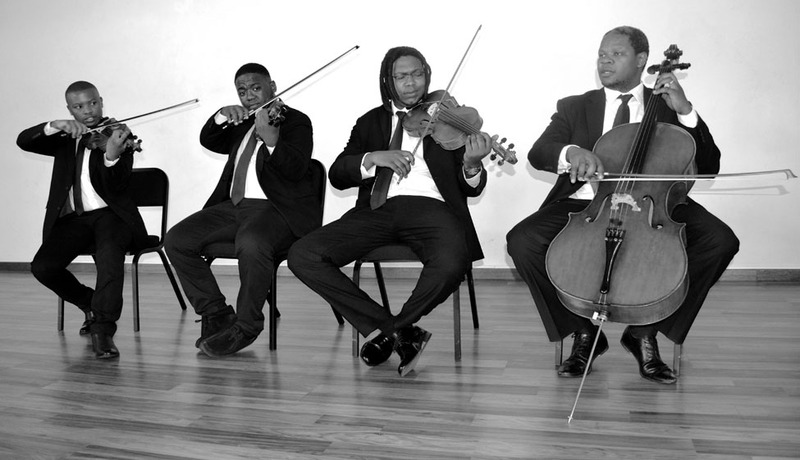 Resonance String Quartet’s repertoire is extensive and they give the audience a classical spin on many genres of music, including Jazz, Kwela, Pop, Soul, Tangos, Hymns, Film/Musicals and African music. Although recently formed, each member has also had a wealth of chamber music experience with various other chamber groups. This includes playing at the National Arts festival in Grahamstown and Festival Culturel International De Musique Symphonique in Algeria and the Standard Bank Joy of Jazz accompanying Gregory Porter. They have also played on CD/DVD recordings with a number of artists like Judith Siphuma, Sibongile Khumalo, Zahara, Bala Brothers, HHP and many more. The biggest highlight for 2013 was being asked to play at the movie premiere of Mandela: Long Walk To Freedom held in Johannesburg, then being invited to play at ANC Nelson Mandela’s Memorial Service held in Polokwano at Peter Mokaba Stadium with the amazing Soprano Pretty Yende. In their solo careers the members of the Resonance String Quartet have enjoyed the privilege of performing a number of concertos as well as solo recitals in South Africa and abroad. The quartet members freelance as orchestral musicians with the Johannesburg Philharmonic Orchestra (JPO), Johannesburg Festival Orchestra (JFO) and Johannesburg Music Initiative (JMI). Other than being performers, the quartet members also teach music at different institutions like The Ophra Winfrey Leadership Academy for Girls, MIAGI, Buskaid and the Johannesburg Youth Orchestra Company. The quartet has recently released its 1st debut cd called KUANZA(The Start/Genesis) in October 2015. It includes a few of the pop, jazz and classical music they play at many of their gigs. The Resonance String Quartet definitely lives up to their name. The rich blend of the group radiates an overwhelming glow, which is undeniably 'music to our ears'.